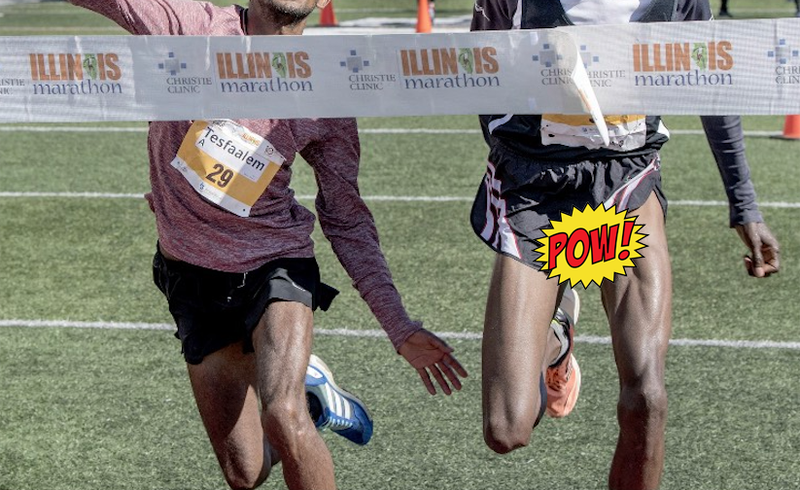 The 2018 Christie Clinic Illinois Marathon was held Saturday in Champaign, and featured a virtually unheard of finish: runners Tesfaalem Mehari and Wilson Chenwono crossed the finish line at the same instant, and the result was ruled a tie. The runners will reportedly split the combined purse for first and second place, according to a report from the News-Gazette. The be-donged image was tweeted out Saturday morning, apparently before anyone at the News-Gazette noticed the intruding appendage. That tweet was swiftly deleted, and the edited, de-donged imaged was then put into both the story on the website and on the replacement tweet. I contacted Rick Danzl, the News-Gazette photographer credited with the photo, and will update this post if he responds.